Backup data on a faster hard disk with a monstrous capacity — Fujitsu Mobile 120 GB internal hard drive. The Fujitsu internal hard drive has a 5,400-rpm rotational speed, which boosts reading from and writing to the hard drive. This 120 GB Fujitsu hard drive boots your OS faster, and loads applications much quicker. The Fujitsu Mobile 120 GB internal hard drive’s ample cache memory, and faster average seek time make for reduced power consumption, and generating lesser noise and vibrations. 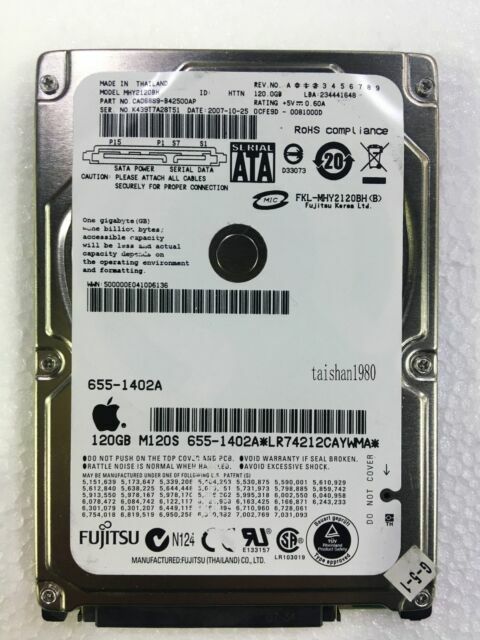 Connecting via a SATA 2 standard port, this Fujitsu internal hard drive provides a very high data transfer rate. The Fujitsu hard drive can be installed in both — Windows-based, or Apple Macintosh computers. Did have to erase and format cause it was Apple base. no scratches worked well. thank you for this hdd and good price. I bought this so I could clone ( using clone software) my Samsung SSD. It worked just fine, I have a clone of my system with all the the OS (Win 7)and updates and current software, and if I ever have a catastrophic problem, I just replace my SSD with this unit re-boot and re-clone the drive using a fast SSD. To be used as a backup or to test a new OS in a laptop, I have used small HDs for system image in the event of a virus or HD failure.